The French press, however, are focusing on the low turnout for yesterday’s election. FRENCH PRESIDENT EMMANUEL Macron’s party is on course for an overwhelming parliamentary majority, after yesterday’s first round of voting for the National Assembly left traditional parties in disarray. Projections showed Macron widening his centrist revolution, with his Republique en Marche (Republic on the Move, REM) party and its ally MoDem tipped to win between 400 and 445 seats in the 577-member National Assembly in next Sunday’s second round. Such a share would give Macron one of the biggest parliamentary majorities for 60 years, despite his party only being founded last year. “France is back,” Prime Minister Edouard Philippe declared triumphantly. “For the past month, the president has shown confidence, willingness and daring in France and on the international stage,” Philippe said, calling the result a vindication of Macron’s “winning strategy”. But the vote was marked by record low turnout of 49%, possibly reflecting fatalism among Macron’s opponents in the face of his seemingly unstoppable advance, experts said. The right-wing Republicans – who had hoped to rebound from their humiliation in the presidential vote – were shown trailing in second with a predicted 70-130 seats while Marine Le Pen’s far-right National Front (FN) was forecast to garner between one and 10 seats. The FN’s result showed the party is struggling to rebound from Le Pen’s bruising defeat by Macron in the presidential run-off. The FN’s deputy leader Florian Philippot admitted to “disappointment” and called on voters to “mobilise massively” for the second round. The worst losses, however, were for the Socialists of Macron’s predecessor Francois Hollande and their allies, who are predicted to lose a staggering 200 seats. The party’s chief Jean-Christophe Cambadelis and its failed presidential candidate Benoit Hamon both lost their seats. Conceding that the party was facing “unprecedented” losses, Cambadelis appealed to voters to rally behind Macron’s rivals to avoid the president monopolising power. Parliament risked having “no real oversight powers and no democratic debate worth speaking of,” he warned. Former Republicans party leader Jean-Francois Cope said the results were “a disaster”. “It’s the continuation of the real disaster that the presidential election was… we need to rebuild everything,” he told BFMTV. Official final results released early today showed Macron’s one-year-old REM and MoDem winning 32.32% in the first round, ahead of the Republicans on 21.56% and the FN on 13.20%. The Socialists and their allies secured just 9.51% while the radical left and communists were on 13.74%. Few MPs were elected outright on Sunday. If no candidate wins over 50%, the two top-placed contenders go into the second round – along with any other candidate who garners at least 12.5% of registered voters in the district. France’s youngest-ever president at 39, Macron has gained praise for appointing a balanced cabinet that straddles the left-right divide and taking a leading role in Europe’s fight-back against US President Donald Trump on climate change. German Chancellor Angela Merkel congratulated Macron on a “great success” yesterday. The French press today noted Macron’s success but stressed the record abstention rate keeps its political significance in perspective. “Macron on the move to an overwhelming majority” said national daily Le Figaro while Le Parisien hailed “A master stroke”. 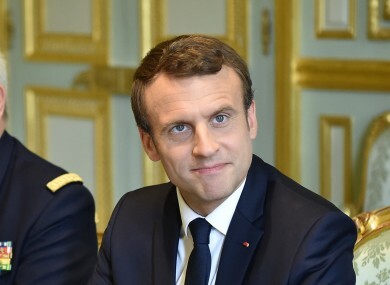 However “neither his 24% in the first round of the presidential election, nor the 50% abstention this Sunday should give the illusion of a France converted to ‘Macronmania’,” noted Nicolas Beytout in L’Opinion. If the seat projections are confirmed next week, Macron will have a strong mandate to push through the ambitious labour, economic and social reforms he promised on the campaign trail. Macron, who had never held elected office before becoming president, will also have succeeded in ushering in a younger and more diverse parliament with more women and ethnic minorities. His party fielded political novices in around 200 constituencies. They include Marie Sara, a retired bullfighter, who went through to a runoff against FN stalwart Gilbert Collard in southern France, and star mathematician Cedric Villani. Macron is also trying to bring in an era of cleaner politics. His government’s first bill proposes to ban lawmakers from employing family members or performing consultancy work while in office. The measures follow the scandal that destroyed the presidential bid of Republicans candidate Francois Fillon, who has been charged over payments to his wife and two of his children for suspected fake jobs as parliamentary assistants. Fillon denies the charges. Macron’s party has largely avoided controversy but one of his ministers who is running for re-election in Brittany, Richard Ferrand, is being probed over a property deal involving his girlfriend. Forecasts show Le Pen’s party will struggle to win the 15 seats it would need to form a parliamentary group and help shape the assembly’s agenda. The radical-left France Insoumise (France Unbowed) party of Jean-Luc Melenchon who finished fourth in the presidential race also fell short of expectations. His camp was tipped to only take 10-23 seats. Macron has urged voters to back his reform proposals including an overhaul of the rigid rules governing the job market, blamed by many economists for holding back growth. Email “'France is back': Macron smiling as rivals face crushing defeat in election”. Feedback on “'France is back': Macron smiling as rivals face crushing defeat in election”.